This account was accepted with variations by many 19th century Irish historians and genealogists, including John G.A. Prim, who perpetuated the claims that the Comerfords of Kilkenny originated in Staffordshire. The Comberford family, which took its name from the village of the same name, was prominent in the political life of Tamworth for a few decades in the 17th century, and gave its name to the Comberford Chapel, where some of the most prominent family members were buried, in Saint Editha’s, the town’s parish church. However, the Comberford family fell foul of the political turmoils of the civil war, and a Royalist and Catholic branch of the family appears to have become extinct in the male line 1660s, and through its debts and mortgages unable to hold on to its claims to the Comberford estates which were also claimed by a junior, but Quaker and ex-Parliamentarian branch of the family in neighbouring Shropshire. A plaque erected in the Comberford Chapel in the north transept of Saint Editha’s Church, Tamworth, in 1725 claims the Comerfords of Ireland were a branch of the Comberford family, and a similar claim is made, through the use of the coat-of-arms of the Comberfords of Tamworth, in a monument erected about the same time in Saint Mary’s Church in Callan, Co Kilkenny. These claims may have an earlier provenance, for the Comberford coat-of-arms were being used by the Comerfords of Ireland in the early 17th century, when Patrick Comerford was Bishop of Waterford and Lismore. 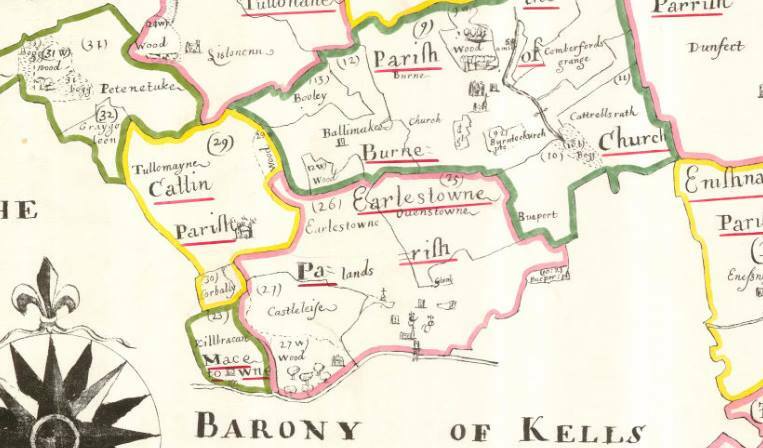 Pedigrees that exaggerated the ancestral claims of the “Old English” families were commonplace in south-east Ireland from the 16th century, and similar fanciful genealogies were constructed, for example, for the Grace, Langton and Shee families of Kilkenny. As we have seen, the origins of the Comerford family of south-east Ireland are to be found not in the Staffordshire family of royalists, recusants and Quakers, but in the village of Quemerford in Wiltshire. Nevertheless, it is as though the Comerfords of Ireland and the Comberfords of Staffordshire had adopted each other as family and kin. These mutual bonds of affection and adopted kinship, these claims and the confusion they have caused when it comes to identifying the origins of the Comerford family in Ireland, continued through the persistent use of the Comberford coat-of-arms by many branches of the Irish Comerford family from the early 17th century. The Down Survey, conducted in 1655-1658, uses the spelling Comberford when referring to Comerford family lands in Co Kilkenny, as in Comberford’s Grange. Whether these are links or confusions, there mutual bonds of affection and adopted kinship were consolidated in the following century with Joseph Comerford’s lengthy visit to Tamworth and Comberford, when he erected the Comberford monument in the Comberford chapel in 1725. It was a mutual bond of affection and adopted kinship that continued with the interesting visit to Comberford, Tamworth, Wednesbury and Lichfield from Ireland by my great-grandfather James Comerford at the turn of the 19th and 20th centuries. Around August 1900 or 1901, James Comerford, describing himself as “a descendant” of the Comberford family, set out to rediscover and own the Comberford roots of the Comerford family, visiting Comberford Hall, the Moat House, the Comberford Chapel and Saint Editha’s Church, Tamworth, and Wednesbury. In Saint Editha’s, he took detailed notes of the Comberford plaque erected by Joseph Comerford in 1725, and of the alabaster effigy, which he ascribed to William de Comberford (1349). In Saint Bartholomew’s Church, Wednesbury, he saw the figures of John Comberford in armour and his wife, the name of William Comberford among a list of charitable bequests over the south door, and the name of William Comberford (1623) inscribed on the sixth bell. He also noted many of the references to the Comberford family in other records. At Comberford Hall, he visited the Peel family, and he also visited the Moat House in Tamworth. James Comerford collected his findings in a very small, seven-page pamphlet, that was privately published in a small print run on 26 November 1902, and bound with it photographs of the Moat House and Saint Editha’s Church, Tamworth – although, surprisingly, there are no photographs of the Comberford monuments he describes in Tamworth and Wednesbury, or of Comberford Hall. Shortly after the account of his visit was printed and bound, James Comerford added his bookplate and additional handwritten notes to the slim volume, and these notes add further clues to his identity and the date of his visit. The surviving copy of this valuable publication is in the local history collection at Tamworth Library, Corporation Street, Tamworth (open shelves, T/COM), with a pencilled page of notes recording the details of his visit one August day. In this rare publication, James Comerford notes that a member of the family “recently was made Bishop (Roman Catholic)” – and in his own hand he adds the words “of Carlow” after the word bishop and adds his initials. Michael Comerford was consecrated coadjutor Bishop of Kildare and Leighlin in Carlow on 1 January 1889, and died on 19 August 1895. The Peel family was living at Comberford Hall from from about 1900 until about 1904, [see Comberford 8: Comberford Hall] placing James Comerford’s visit sometime in the early 1900s but before it was printed and bound in 1902, while the Peel family was living at Comberford Hall. Printing and binding followed soon after. Although the bookplate is similar to that of James Comerford, the London book collector and antiquarian, that James Comerford died in 1881, before the Peel family moved into Comberford Hall, and almost eight years before Michael Comerford’s episcopal elevation. We therefore have to look at Michael Comerford’s extended family to find a James Comerford from Ireland who could visit Comberford Hall and Tamworth some time around 1900 to 1902, and the obvious candidate must be his second cousin, James Comerford (1817-1902) [see Comerford 8: Comerford of Bunclody and Dublin and Comerford Profiles 18: James Comerford (1817-1902), Victorian stucco artist and architect]. The binding of the slim volume may have been a final tribute by his family to James Comerford, who died 18 days later at 11 Upper Beechwood Avenue in Ranelagh, Dublin, on 14 December 1902. All these ties of affection amount to bonds of kinship, and they make it important to record the history of the Comberfords of Comberford when telling to story of the Comerfords of Ireland. William Healy, History and Antiquities of Kilkenny (County and City), 2 vols (Kilkenny, 1893), vol 1, p 61; Charles ffrench Blake Forster, Irish Chieftains (1872), p. 476, n. 68. For example, see Journal of the Association for the Preservation of the Memorials of the Dead, ii (Dublin, 1895), pp 146-148. The pedigree registered for Joseph Comerford of Anglure by Sir William Hawkins on 22 April 1724 gives Roger de Comerford, Baron of Danganmore, as first ancestor of the family and marries him, rather than Sir Henry, to Ann, daughter of Sir Hugh de Lacy. Prim, ‘The Wayside Crosses of Kilkenny,’ pp. 168-185. See DP Adams, The Moat House and the Comberford Family (Tamworth, 1967), passim. George Dames Burtchaell, Genealogical Memoirs of the Members of Parliament for the County and City of Kilkenny (Dublin, 1888), p. 19. G.O. Ms 160, ff 102-104. See James Comerford, Some Records of the Comerford family collected by a descendant, privately published and dated 26 November 1902, Tamworth Library, Local History Collection, shelf T/COM. James Comerford (1902), pp 1-2, 6. James Comerford (1902), p. 3. James Comerford (1902), pp 3-5. James Comerford (1902), p. 4. James Comerford (1902), p. 4, and photograph facing p. 4. Last updated: 29 October 2008; 4 April 2009, 17 August 2009, 15 December 2009; 10 August 2010, 4 October 2010; 3 March 2011; 31 May 2012; 2 May 2017.